One such company is Lam Research (LRCX – very attractive rating). One of September’s most attractive stocks, LRCX offers investors hidden value. Per Figure 1 above, LRCX’s economic earnings are growing at least as fast or faster than its GAAP earnings over each of the past five years. 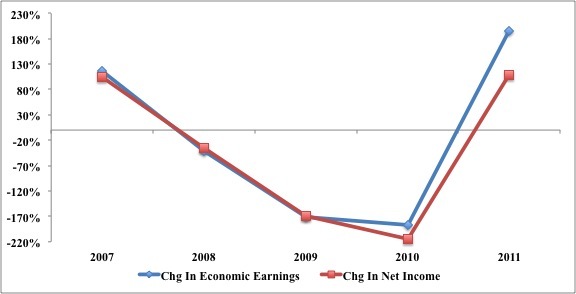 2011shows a distinct acceleration in the improvement of economic earnings versus reported net income. The superior growth in the economics of LRCX’s business comes from growing its after-tax cash flow (NOPAT) faster than its balance sheet (invested capital). 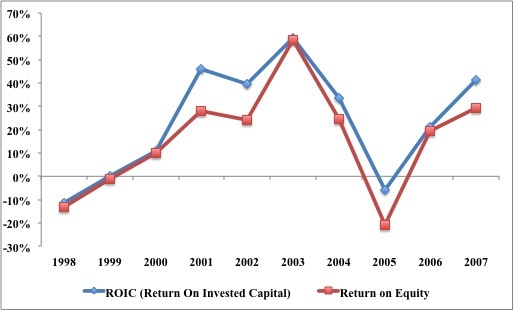 This drives acceleration in the company’s return on invested capital (ROIC), which also exceeds it accounting counterpart, return on equity (ROE). See Figure 2. The differences between the economics of LRCX’s business and its accounting are not perceptible to the naked eye. After combing through the company’s financial footnotes, we removed about $11.5 million in non-operating charges buried in operating income and understate GAAP earnings. Our largest adjustment to the reported accounting results comes from deducting nearly $2 billion in excess cash from the reported assets of the business. Excess cash is removed from the denominator of our ROIC calculation because it represents the past profits of the business and is not part of the shareholders’ original investment. Excess cash still belongs to shareholders. However, removing it from invested capital allows truer analysis of the economics of the business and offers a better proxy for the company’s marginal return on investment. The bottom line is that Lam Research is not only a very profitable business but it is also more profitable than the accounting results suggest. It’s ROIC ranks in the top quintile of all companies in the Russell 3000 and its economic earnings are growing faster than its accounting earnings. Accelerating profits alone should never drive an investment decision. Making money picking stocks comes from buying stocks with future cash flow expectations that are too low (or too high if you like to short). LRCX’s stock definitely reflects low expectations for future cash flows. The current stock price of ~ $38 implies the company’s NOPAT will permanently decline by nearly 50%. In other words, the stock has upside if future profits do any better than decline by 50%. Put another way, if LRCX’s profits are flat, no growth and no decline, the stock is worth well over $70 per share. That is what I call hidden value. Profits are accelerating and the valuation is depressed. Buy LRCX. For more details on our LRCX model, click here. I also recommend the following ETFs because of their “attractive” rating and exposure to LRCX. Disclosure: I am affiliated with a hedge fund that owns LRCX. I receive no compensation to write about any specific stock, sector or theme. 1 Response to "Buy LRCX: More Value Than Meets the Eye"